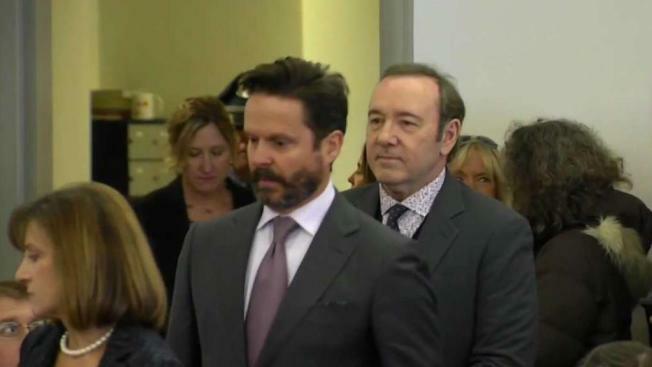 Kevin Spacey, who was accused of groping a former Boston television anchor's 18-year-old son at a Nantucket restaurant in 2016, was not required to attend the hearing in Nantucket District Court. A judge is weighing motions filed by lawyers for Kevin Spacey, charged with groping an 18-year-old man on Nantucket in 2016. The Oscar-winning former "House of Cards" actor didn't attend Thursday's hearing at Nantucket District Court. Spacey's attorneys have been seeking to preserve phone and electronic records between the man -- who says Spacey unzipped his pants and fondled him -- and the man's girlfriend at the time. USA Today reports the hearing concluded with the judge taking the motions under advisement. The assault allegedly occurred at a restaurant on the island off Cape Cod where the young man worked as a busboy. Spacey pleaded not guilty in January to felony indecent assault and battery. His lawyers have called the accusations "patently false." The next hearing is June 3. Sexual assault resources are available at the National Sexual Violence Resources Center and the National Sexual Assault Telephone Hotline at 800-656-4673. Since it was first created in 1994, the National Sexual Assault Hotline has helped more than two million people, according to its website.